Half A Century Since Marlin Briscoe, What Is The State Of NFL Black Starting Quarterbacks? You are here: Home / News / Half A Century Since Marlin Briscoe, What Is The State Of NFL Black Starting Quarterbacks? (ThyBlackMan.com) The most high profile position in sports is arguably that of being the starting quarterback of a NFL franchise. Even with all of the controversy surrounding the NFL, it remains the king of sports in America. The notoriety, attention, and the terrific paycheck that can come with being a starting quarterback is high level as well. It is also worth mentioning that playing quarterback in the NFL is extremely hard due to the speed, size, strength of the athletes that compete in the league and the complexity of NFL defenses. The 2018 NFL season has kicked off and there are 32 NFL starting quarterbacks hoping to lead their teams to varying degrees of success this year. It is also possible that the amount of starting black quarterbacks currently in the NFL has surpassed any in the NFL’s history. The “Jackie Robinson” of black quarterbacks is Marlin Briscoe. In 1968, Briscoe became the first starting black quarterback in the modern professional football history for the Denver Broncos of the American Football League. The American Football League would eventually merge with the National Football League years later but Briscoe made history. 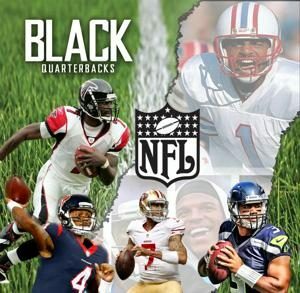 Racial stereotypes of black men prevented black college quarterbacks from getting consistent quarterback chances throughout NFL history as black men were not perceived as having the intelligence, leadership, acumen, work ethic, and throwing ability to be the most important player on the football field. There has been at least one black quarterback in the NFL in every season starting in 1968. But there has been flashes of multiple high profile black quarterbacks in the NFL over the last several decades. During the 1970s, men like Joe Gilliam and Vince Evans were among the most successful black quarterbacks. There was a breakthrough during the 1978 NFL Draft as Doug Williams of Grambling State was selected with the 17th pick in the first round, marking history as no black quarterback had ever been selected before the sixth round of the NFL Draft. Williams ultimately became known as the first black starting quarterback to lead a NFL team to a Super Bowl championship after winning it for Washington during Super Bowl XXII. In the 1980s, Warren Moon, who dominated the Canadian Football League after no interest from NFL teams, and Randall Cunningham had dynamic long term careers with Moon becoming a Pro Football Hall of Famer. It is also worth mentioning that they did so with different styles with Moon making most of his plays within the pocket and Cunningham showing rare athleticism and improvisational ability for the position. The 1990s would also include an important year for black quarterbacks. While strong armed signal callers like Steve McNair, Kordell Stewart, and Jeff Blake battled each other often in the then-named AFC Central, the 1999 NFL Draft was hyped as one of the best NFL Drafts for quarterbacks ever as five quarterbacks, three of whom were black, being selected including former Syracuse QB Donovan McNabb was selected by the Philadelphia Eagles with the second overall pick, former Oregon QB Akili Smith was selected third by the Cincinnati Bengals and former UCF Daunte Culpepper was selected 11th by the Minnesota Vikings. The 2000s was a renaissance decade for black quarterbacks that started with the historic selection of Michael Vick as the first overall pick of the 2001 NFL Draft by the Atlanta Falcons, the first black quarterback ever picked first. The love affair between Vick and the city of Atlanta was extremely unique as his playing style and persona fit the city like a glove before his dogfighting issues. The 2003 NFL season was a banner year for black starting quarterbacks as eight black quarterbacks played at least half their team’s games not including Michael Vick who had an injury plagued season. There were quarterbacks of various levels and stages of their careers including promising stars like McNabb and Culpepper, steady veterans like McNair and Blake, and young prospects like Byron Leftwich and Quincy Carter. The 2018 NFL season features of mix of black quarterbacks including established stars like Russell Wilson and Cam Newton, journeymen like Tyrod Taylor, and upstarts like Deshaun Watson. The stigma of taking a black quarterback first overall in the NFL Draft seems to have disappeared as well. Since 2001 when Vick made history, four of the 13 quarterbacks selected have been black and two since JaMarcus Russell’s hugely disappointing NFL career. However, the black quarterback with the most outspoken black politics is not on a NFL roster but is making waves for other reasons. He is a notable absence among the high profile QBs of color in the league.